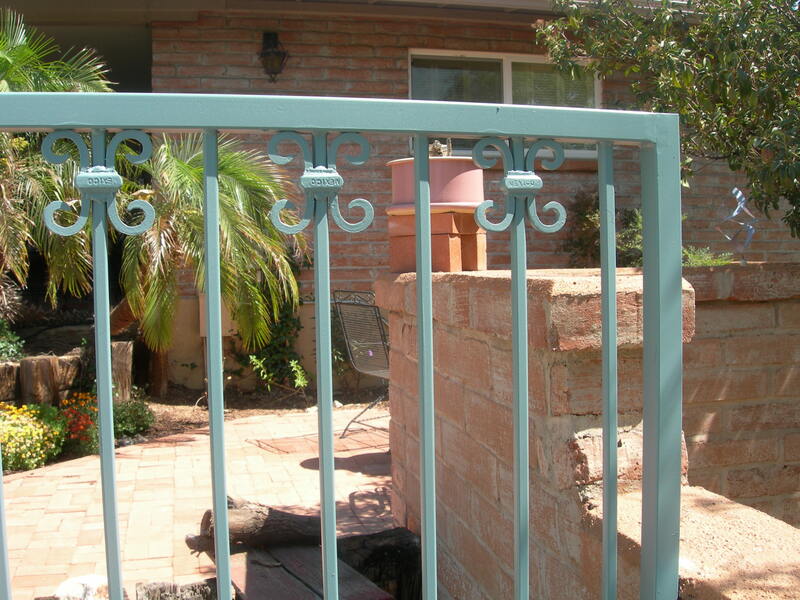 The wrought iron was so rusty, there were areas needing repair before it could be painted. Instead of black, we chose a lighter color – blue spruce. 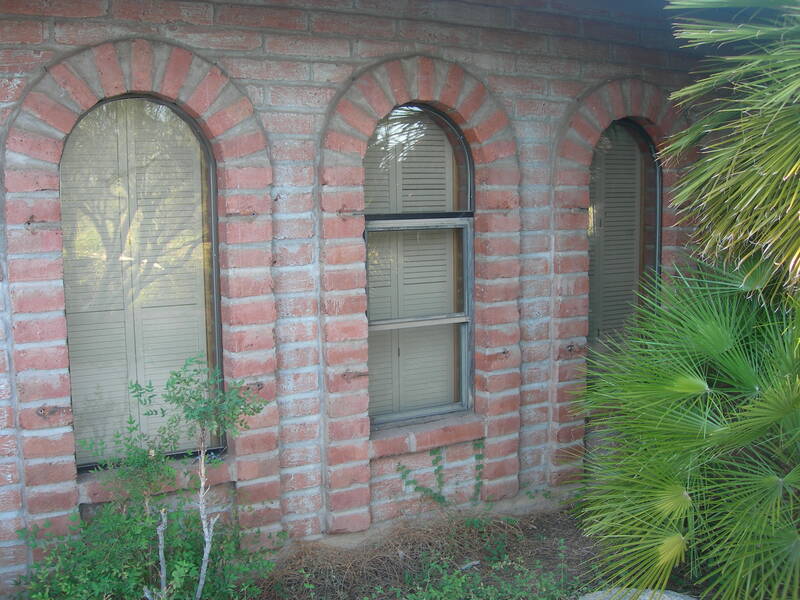 Here are some bars that go over the windows along the side of the garage. Here are the windows along the garage where the bars go. 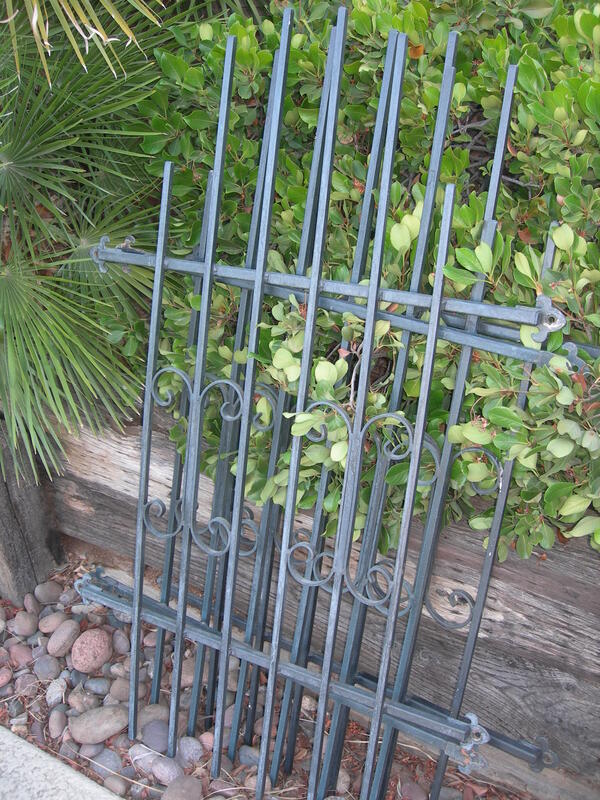 The bars aren’t rusty since they are protected from the weather and the hot summer sun. 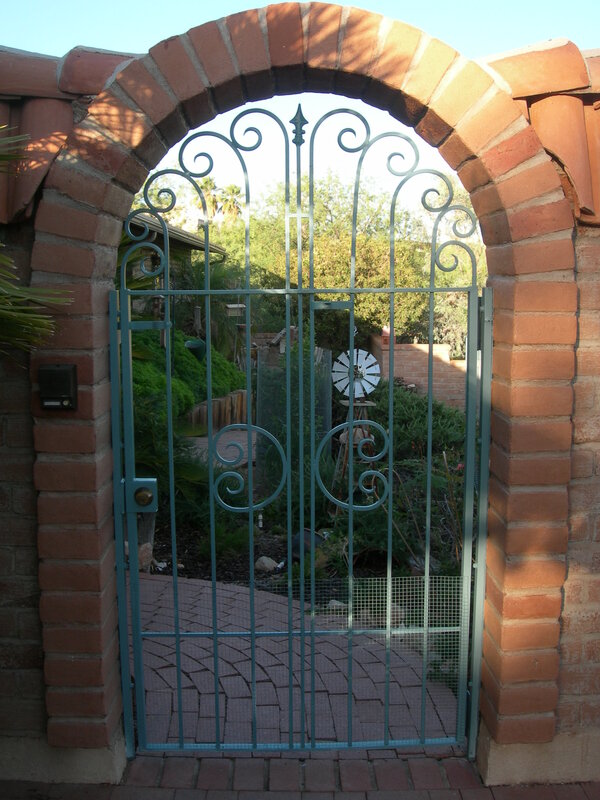 Here is the gate to the front patio, already painted. 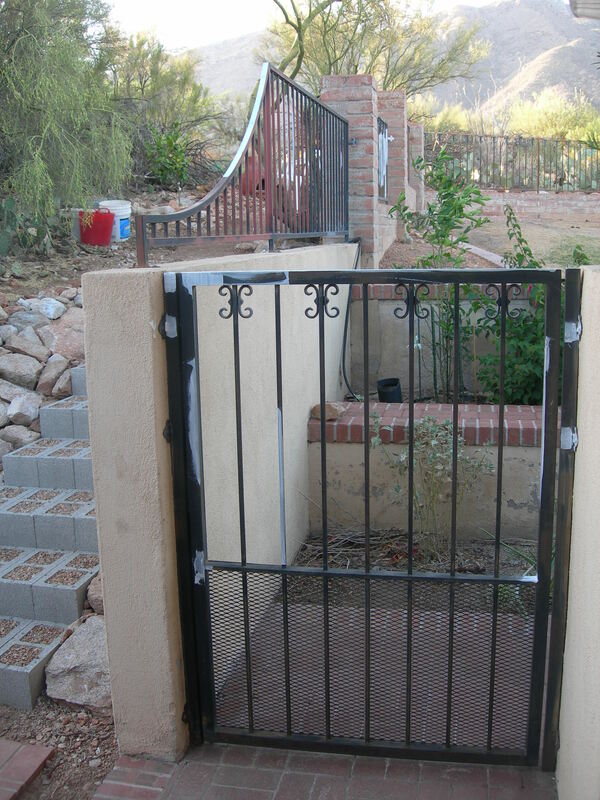 And here is the gate to the back with some primer on it. After getting the steps finished, there was both a lot of dirt and a lot of big rocks left over. This is about the highest part of the property, and I decided to move the dirt to a lower part of the yard, just to get it out of the way. Here are the bigger rocks left over from the rip-wrap. 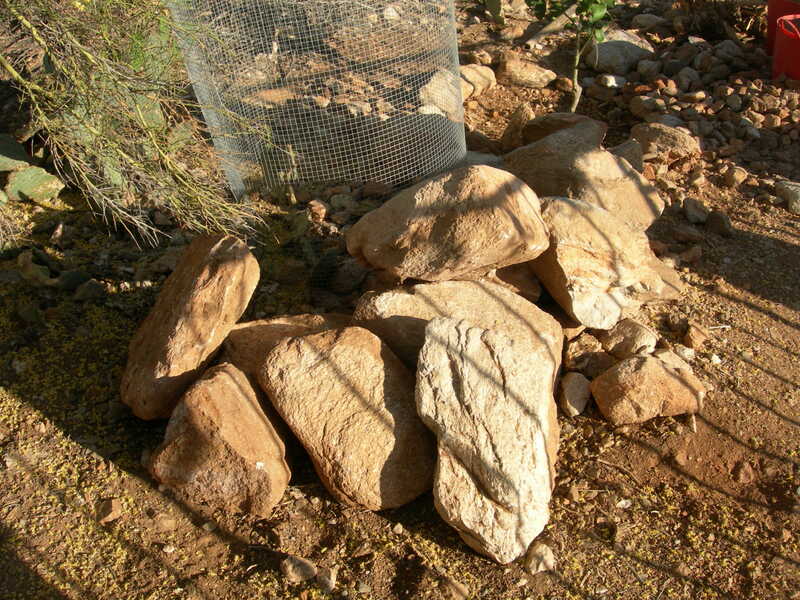 I planned to build up a short rock wall with these rocks. 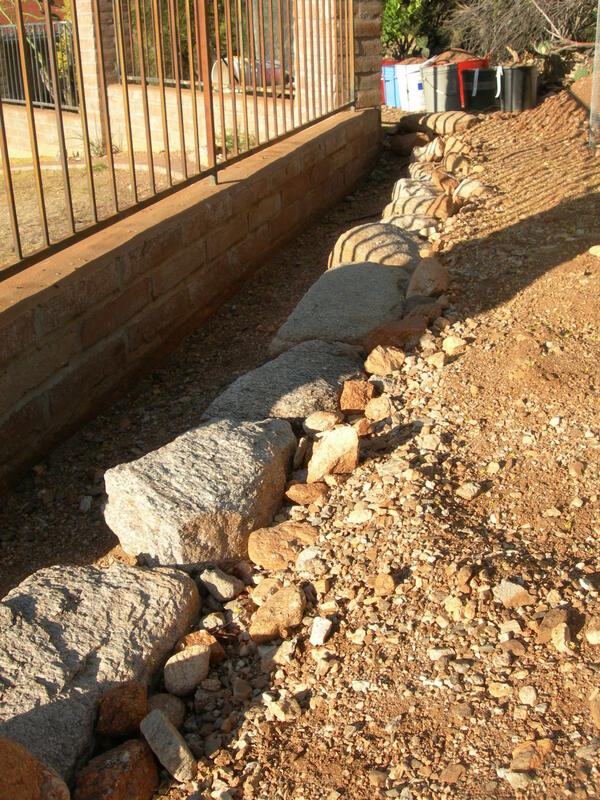 The hillside had been eroding and washing down dirt and rock to the point that it buried the foundation of this short section of block wall and starting to cover up the blocks themselves. The blocks are a a material called burnt adobe. They are clay that has been low fired. 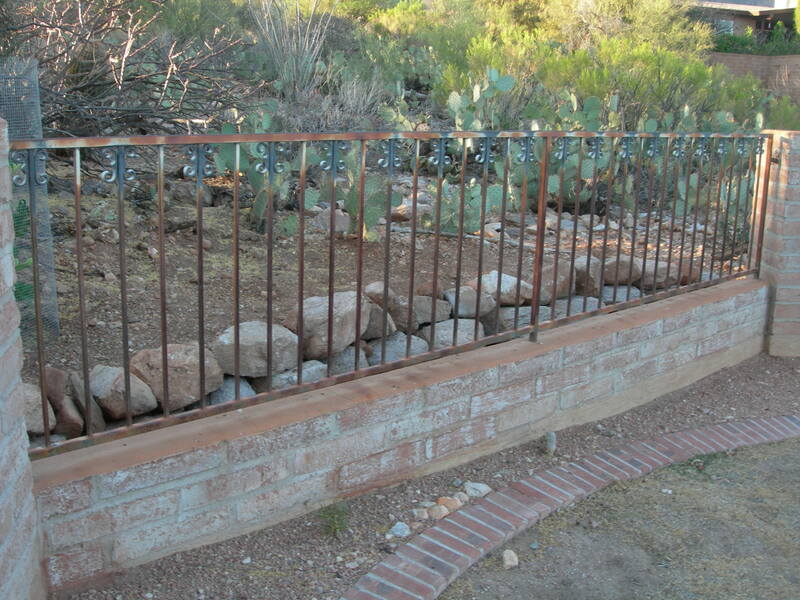 These particular blocks were made in Sasabe, Mexico, just across the Arizona border in the state of Sonora in Mexico. The process of firing the clay does not actually vitrify it, so the blocks themselves can be eroded. Water is particularly bad for the blocks. Once they lose their surface, they break down quickly. Dirt against the burnt adobe can quicken this breakdown. The block actually needs to be waterproofed periodically, and we have the walls and the house waterproofed about once every three years. For some time I had been digging a trench along the wall to keep the dirt away from it. The trench got deeper and deeper as dirt built up on the uphill side of the trench. 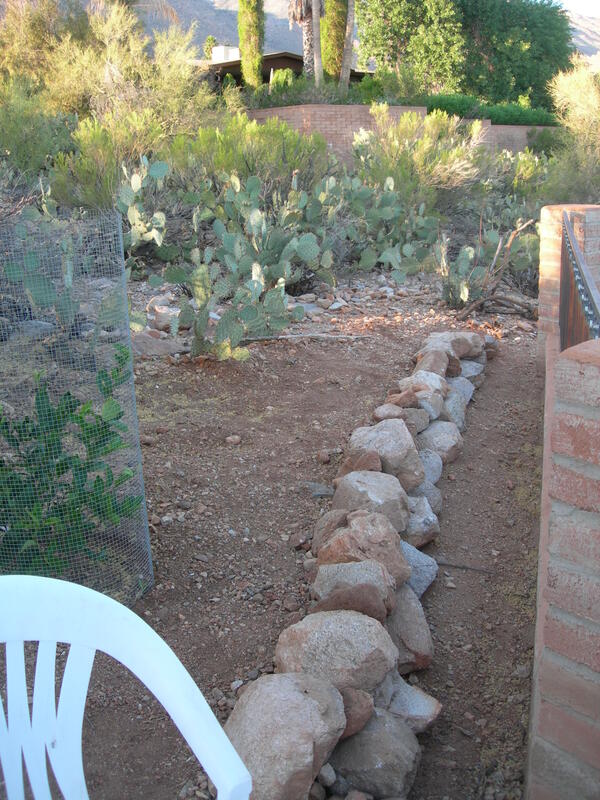 At some point a few years ago I dug the dirt back away from the wall, dug a long notch a couple of feet away from the wall, and set this line of rocks in that notch. Then the space above the rocks was filling up, so it became time to put another course of rocks on the wall. 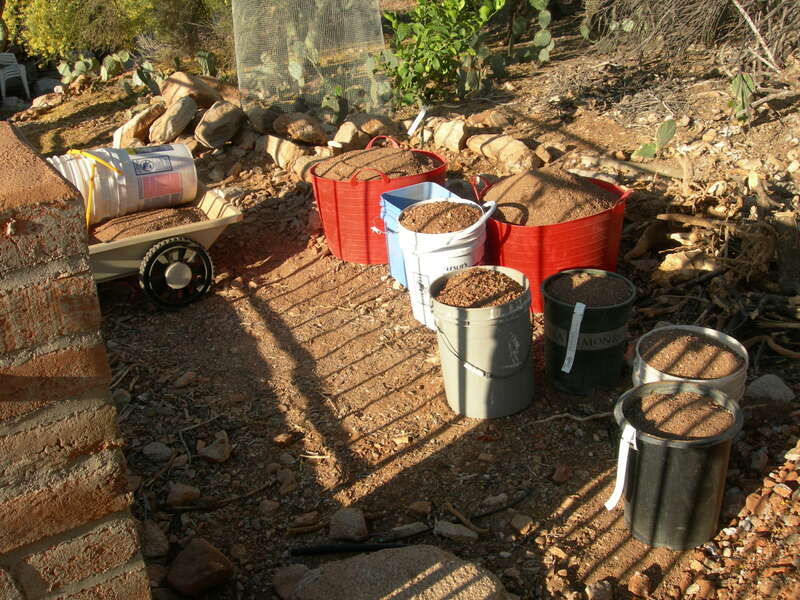 First though, I wanted to deal with those buckets of dirt. Here is another view of the wall. 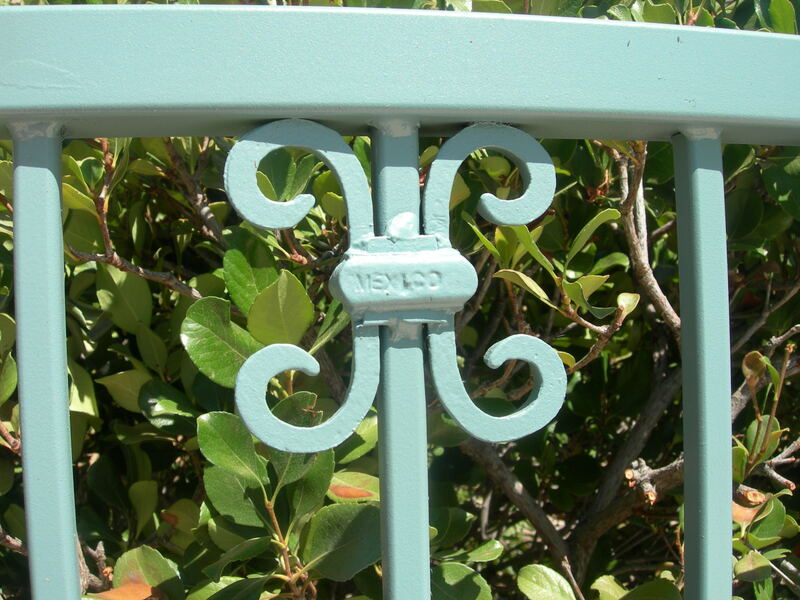 You can see the wrought iron is very rusty. We’re going to get that painted. Here is where I planned to put the dirt from the steps project. 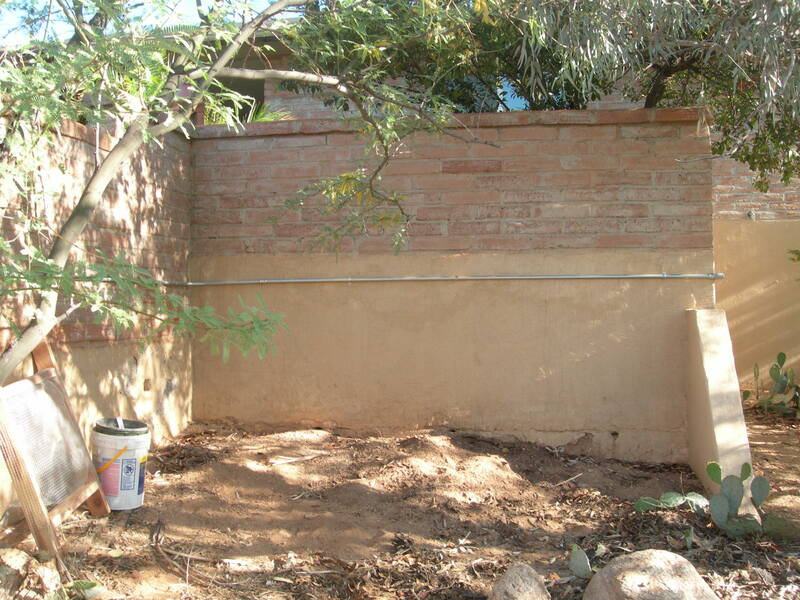 It is below a small patio and against a retaining wall. It is an area where a lot of sand must have been left from building the wall. 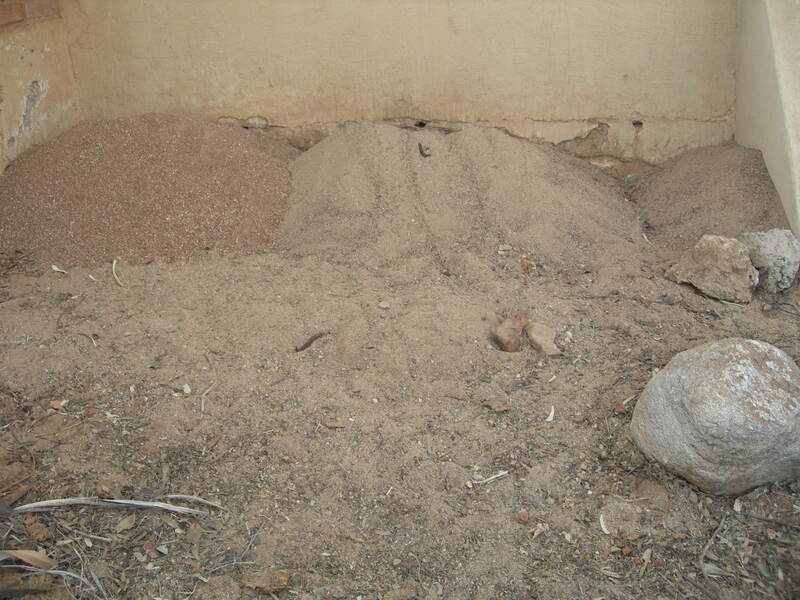 I decided to sift the sand and generally clean up this area. 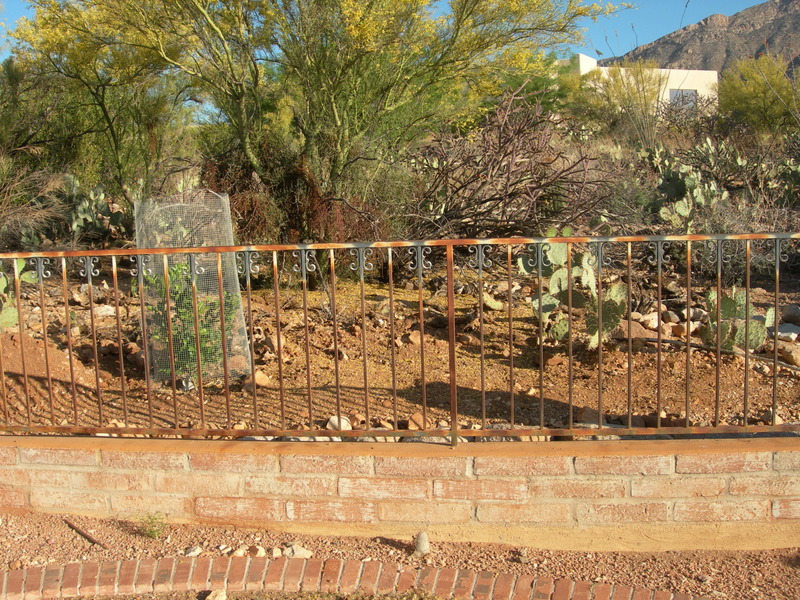 There was a lot of prickly pear cactus and a huge pack rat midden near this area. 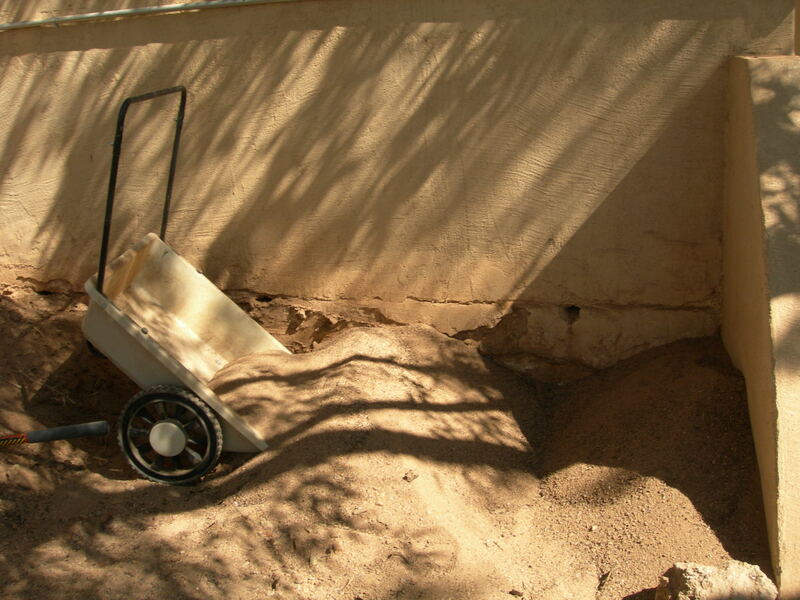 It turned out to be hours of work just to get to the point of moving the dirt, and the wheelie bin trash receptacle was almost too heavy to roll back up the hill to the driveway. Here is the sand and area all cleaned up. And here it is with the dirt. Here is the updated rock wall. 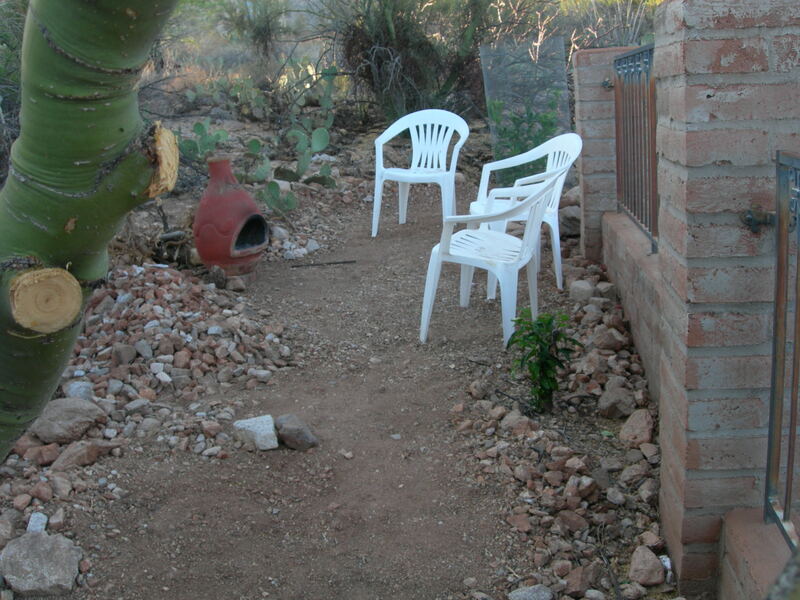 And a little seating area. And the wall from the outside.